Pictured at the Ulster County Local prior to doing home visits to Ulster County Unit non-members are, from left: CSEA Employee Benefit Fund Senior Benefits Specialist Jordan Hughes, CSEA Region Director Charisse Seneres, CSEA Political Action Coordinator Chris Ludlow, Ulster County Unit Vice President Kirk Jones, CSEA Labor Relations Specialist Howard Baul, Ulster County Unit Secretary Sheri Farrell, Ulster County Unit Secretary Tina Buono and Ulster County Unit President Janet Knott. Ulster County Unit Secretary Sheri Farrell, left, and Unit President Janet Knott consult on last-minute details before kicking off a non-member blitz. 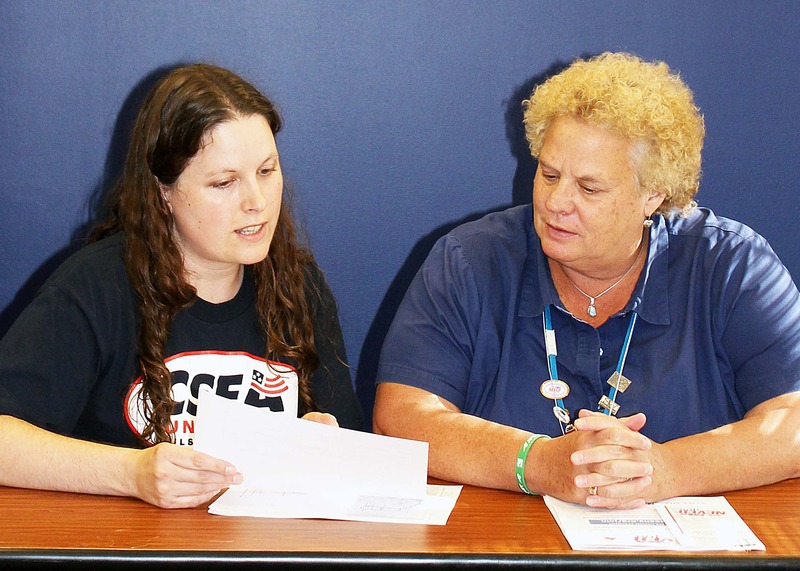 KINGSTON — When our union kicked off our member engagement initiative nearly two years ago, outreach to our members at their homes and worksites meant countless hours of planning by CSEA staff and collaboration with activists on the ground. The fruits of that labor are now being seen, as union activists are fired up and taking the lead in member engagement. One of those activists is Sheri Farrell. Farrell, who serves as Ulster County Unit secretary, recently spearheaded a targeted member engagement blitz aimed at signing up non-members. From developing lists of non-members to mapping driving routes for home visits, Farrell planned every aspect of a two-day enrollment blitz during which unit officers and CSEA staff teamed up and knocked on dozens of doors. Farrell is taking part in the current class of CSEA’s Labor Education and Development (LEAD) program, a program run by Statewide Executive Vice President Mary E. Sullivan aimed at better equipping our newer union activists for leading our union. When the time came to choose a project for her LEAD class, Farrell turned to her executive board. Farrell took part in a larger member engagement visit in Ulster County last year and saw the value of one-on-one conversations with co-workers in strengthening our union. In organizing the two-day visit targeting county unit members, Farrell paired up activists and staff, who headed out after work hours to knock on doors in locations across Ulster County. Ulster County Unit President Janet Knott said she and other unit officers saw how Farrell’s LEAD project could benefit the entire unit. “Getting to full membership sends a message of strength, and we knew Sheri’s organizational skills and commitment to this project would get us closer our goal,” Knott said. Organizing the mini-blitz on her own shows that our members on the ground can continue to build momentum, though Farrell was quick to come back to the importance of teamwork, thanking the officers and staff who joined her in member home visits. “I am extremely grateful to be part of such a cohesive team,” Farrell said.